especially if it has pink roses on it. is using one's special pretty collectibles. 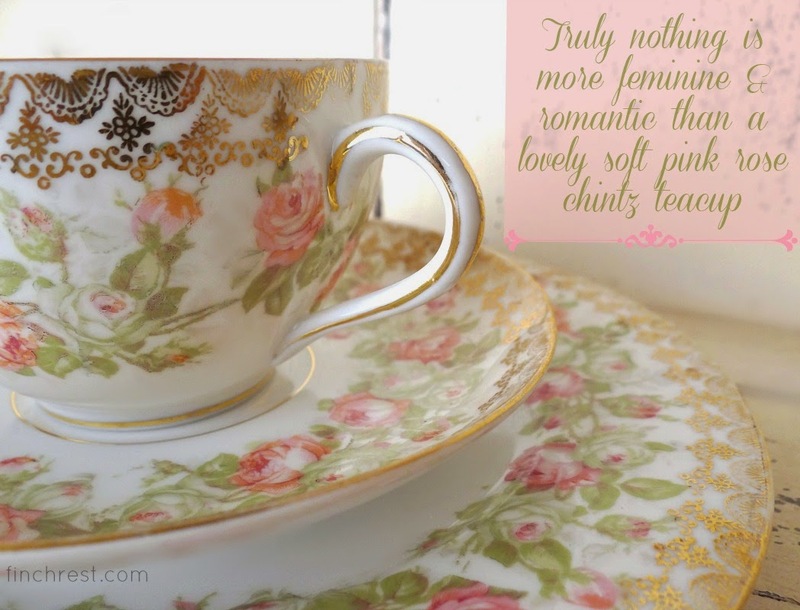 Soft tiny pink rose chintz is my all-time very favorite. My most treasured setting for 12 is this old Bavarian wedding rose. It's taken me my entire adult life to collect the pieces. To this day it's difficult for me not to keep acquiring! use this china for very special tea parties. It's been a very long time since I have done so. I do tend to save it for my spring and summertime teas. AFTERNOON IN THE GARDEN TEA with this china. But this is Ohio and one cannot plan outdoor events far ahead of time for our inclement weather. And one certainly cannot do something of that caliber without a Mrs. Patmore, Mrs. Hughes and Mr. Carson! And one certainly doesn't have the time or extra money to hire it out for real. I wonder if one could charge admittance for putting something like this on without having an operating license? I wonder if one needs to get her head out of the clouds and quit dreaming and get some housework done now? to enjoy and use, don't you? out of a heavy stoneware mug! 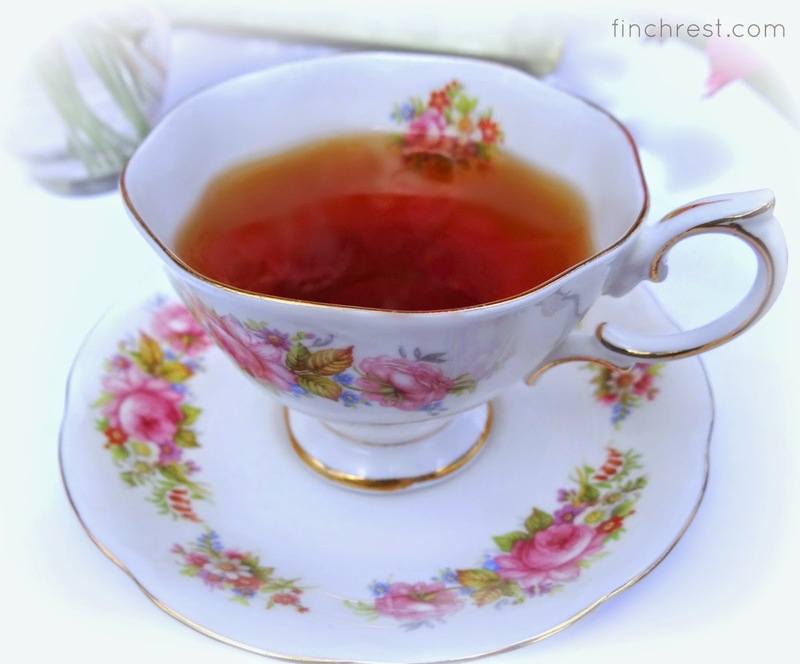 make your next tea time a slow and wonderful ritual! Invite a friend and sip slowly and enjoy! I don't decorate in a shabby chic girlie romantic style. I am sure my very manly husband appreciates that fact. I don't have much of my china displayed. behind cabinet doors or in my china room downstairs. to wish her a happy 5 year bloggaversary! in such a lovely way! I love your Bavarian tea set, it has such beauty and charm, a real delight and should be used and cherished. Have a great weekend. 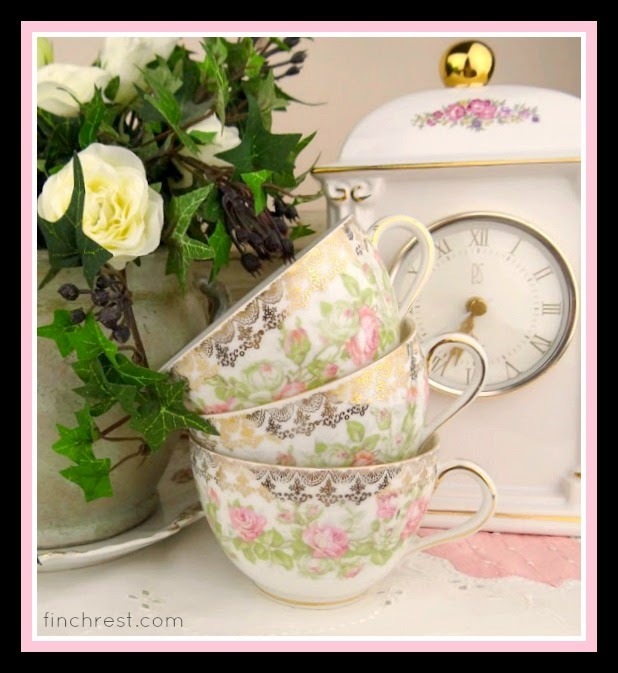 You share the prettiest, sweetest posts, Michele :) Your tea cups are simply beautiful and yes, very romantic. Have a blessed afternoon, dear one! Hugs! 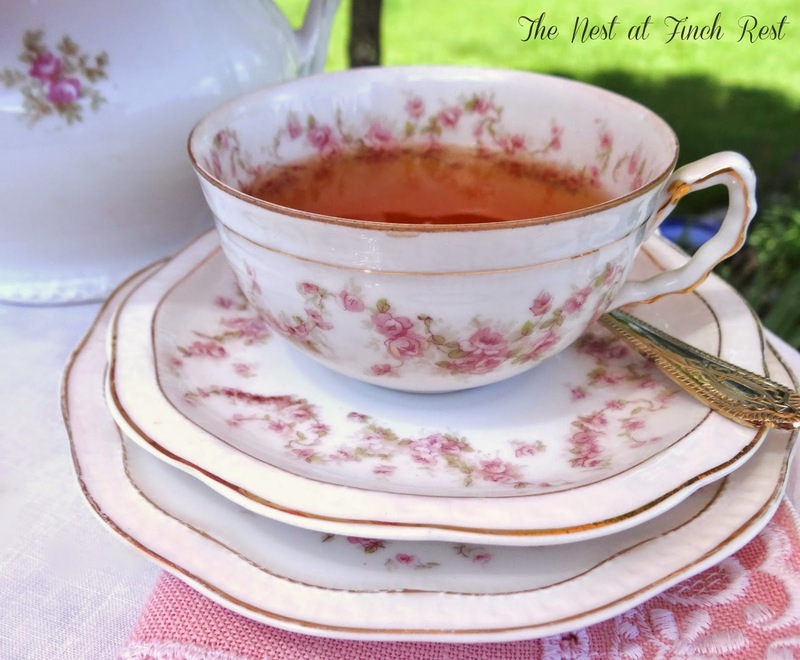 Pretty in Pink tea cups, I love them Michele! Oh this is such a pretty post and looks so summery on this snowy winter's eve. I have a few pieces of Bridal Rose that belonged to my great-grandmother and was passed on down. It's so pretty and delicate. Of course, I love teacups and have a few dozen in my display cupboard. And I love tea. A beautiful post Michele! Oh my Michele, I adore each and every one of your gorgeous teacups. Yes, I agree with you, there's something so special about drinking tea from a beautiful teacup. Maybe one day, you and I both will get the staff to fix a DA tea for us at the click of our fingers!! Your posts always make me smile! These precious teacups are a breath of fresh air...spring! I just love all your tea cups and pots especially the rose ones. Today would have been perfect day to have tea outside, but I was busy cleaning out closets when I would have rather been setting on the patio have a nice relaxing cup of tea. Maybe tomorrow as it's going to be in the 80's. I wouldn't be able to keep that out of sight if I had one so pretty. I especially love the soup bowls. Those little pink bowls? are just darling! What a treat to have those to use for guests. What pretty patterns! I love the tiny rosebud patterns in photos 2 & 3 the best. So delicate!! Lovely! 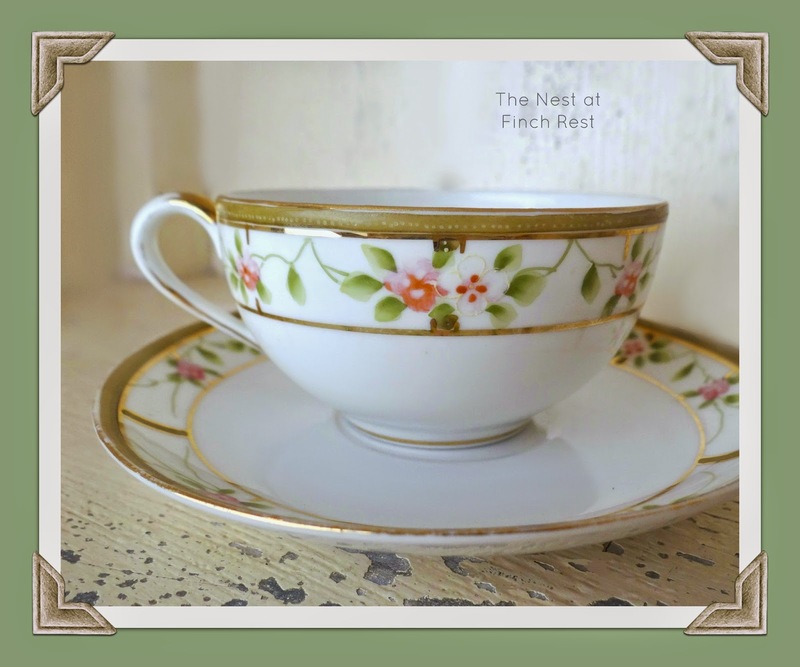 I have a teacup and saucer and plate in that Bridal Rose pattern. Love it. The teapots are gorgeous! Oh, I would drive the five hours or whatever to your house for one of those teas. I could bring along my staff to help out -- haha! Well, I think tea and daydreaming just go together! 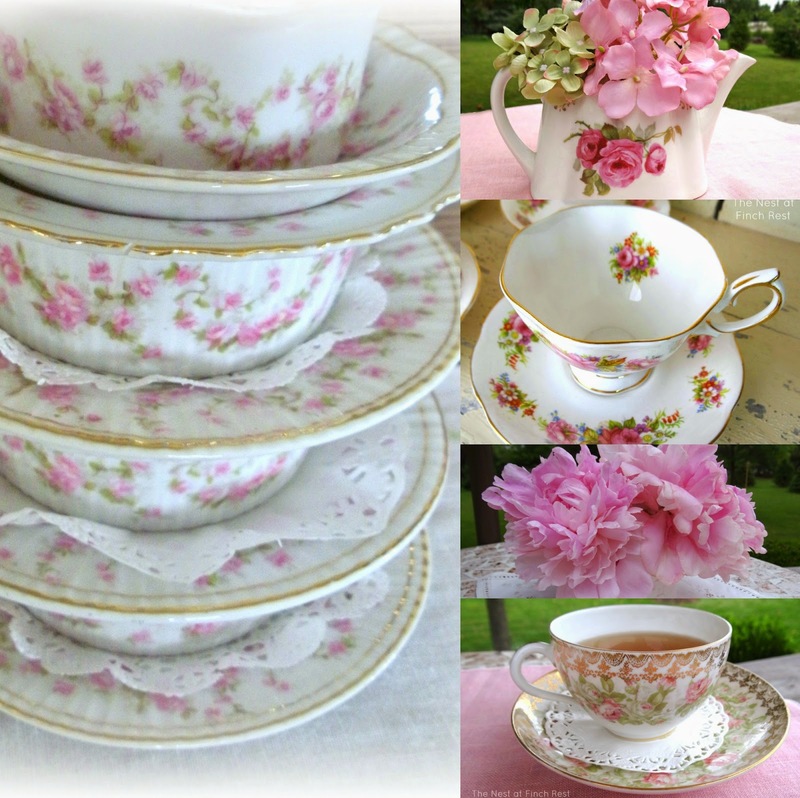 My favourite teacups have tiny pink roses too Michele and to have the whole table set in your chintz pattern would be the nicest tea to attend. Thank you for linking to Mosaic Monday and sharing some feminine beauty! 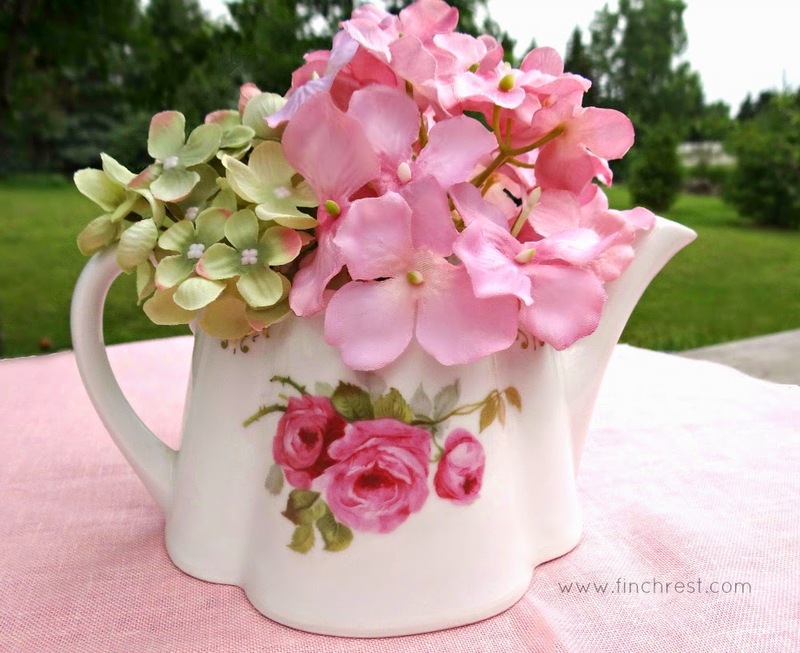 Oh my, Michele, I am swooning over your Bavarian Wedding Rose china! It is a truly feminine and dainty pattern. I love it! How wonderful to have such a large collection of it too. The teapot is a real sweetheart and the rimmed bowls are adorable! Setting your table with these must make your heart sing. Thank you for sharing and helping me celebrate my tea party anniversary. Have a fabulous day and thank you for your very sweet comment. 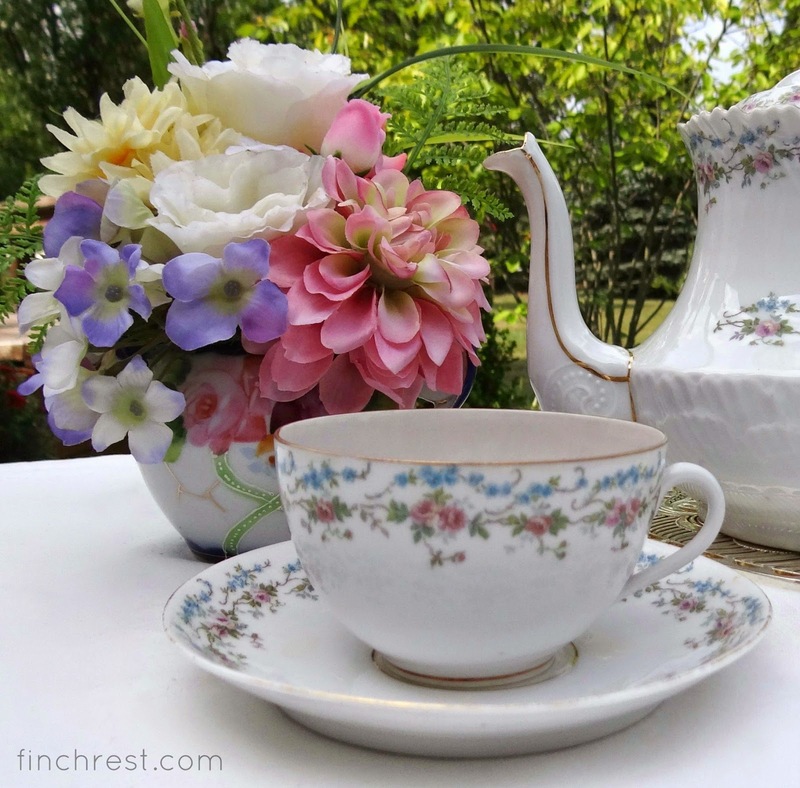 Your rose chintz china is just gorgeous! All the other teacups are too! Wow, what a collection! Your flowers are beautiful too, such lovely photos you took. A whole set! Wow! All of the teacups have such dainty decoration. They are all lovely. Beautiful flowers, too. Happy Tea Day! 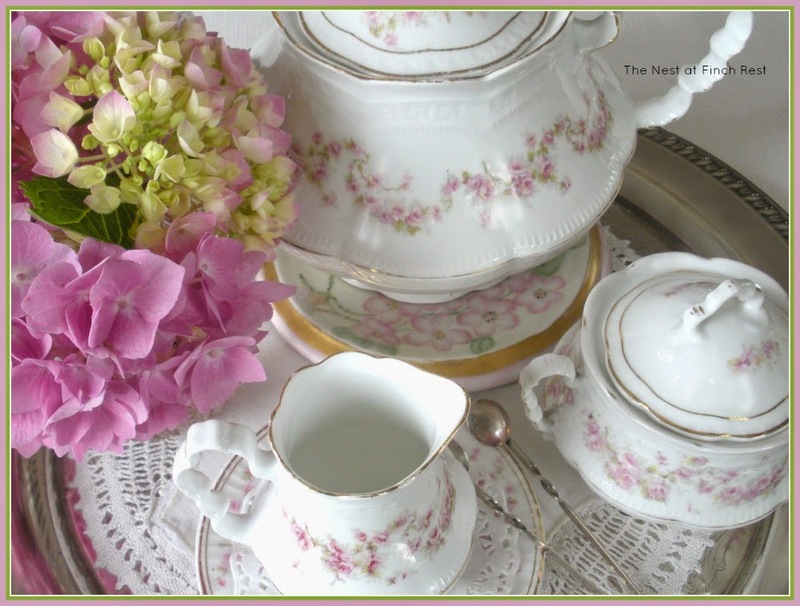 Love your gorgeous rose garlanded china! The Bavarian set is so ethereal! So nice you have such a nice set! I definitely agree that pretty teacups should be used instead of kept in china cabinets all the time! Your Wedding Rose collection is simply enchanting! Well, I have certainly gotten my "beauty" fix for the day here! You know, I think it's blogs such as yours that have spoiled me and keep me from buying as many magazines as I once did. If I flip through and don't see something gorgeous, well, I know where I CAN find something gorgeous. And of course all these pink roses absolutely sing to me. I do think you ought to do a pop-up tea room, as they call them, sometimes. (Easier to ask forgiveness than permission, as they say, ha!) 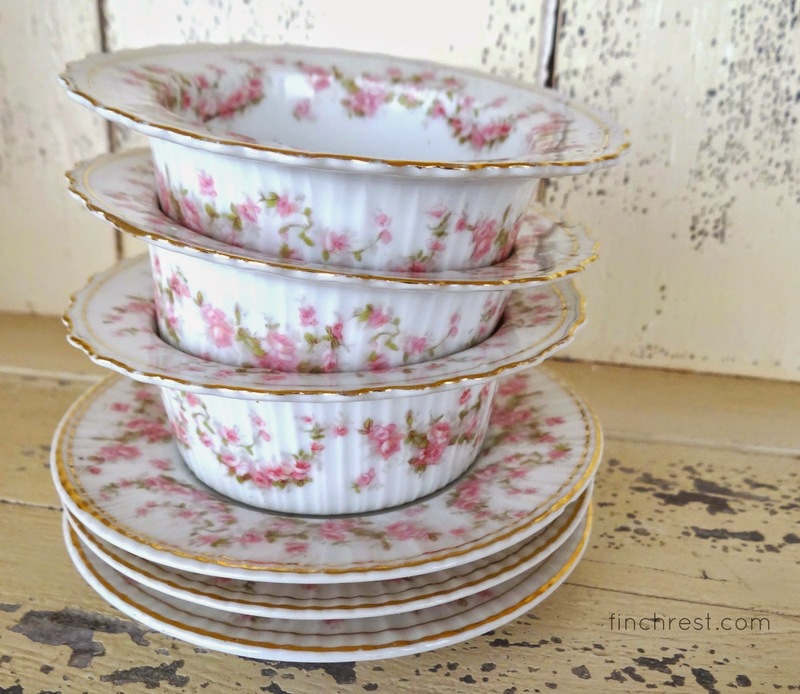 And you even have pink rose ramekins, so I can just envision a real showstopper of a garden tea party. Keeping my fingers crossed for you -- because I want to see the photos, ha! Beautiful china, so delicate and so pretty!! You do share some beautiful tea cups, Michele! And the teapots are gorgeous, too! Such lovely and delicate patterns! You certainly pleased my eyes, thanks. All are just beautiful but I love the rose chintz too. I'm think were there is a will there is a way. Maybe in a church hall for a fund raiser or something? Michele, this post is simply beautiful! I can see why you would collect that pretty Bavarian set. Everything you shared was lovely. 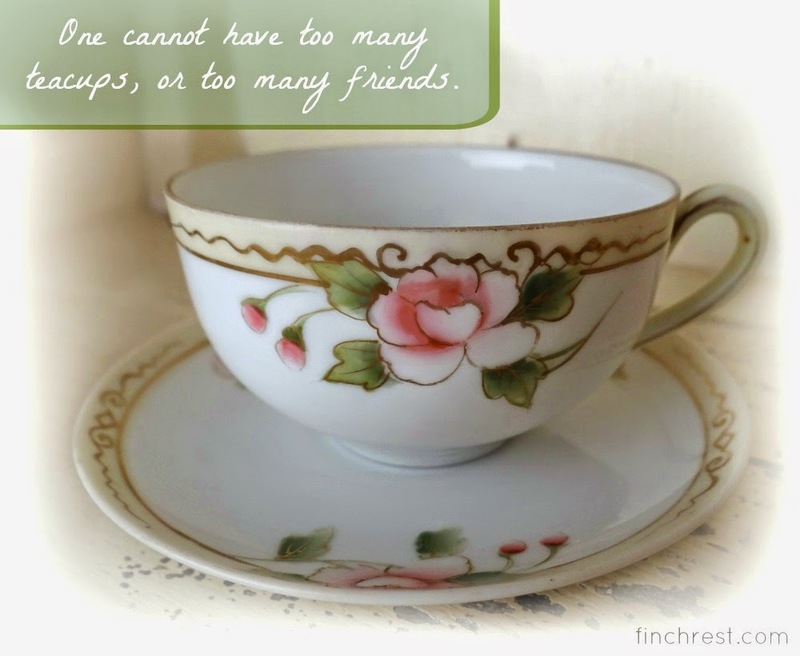 I really like the cup pictures with sayings, especially you can never have too many friends or teacups. Sentiments after my own heart. You should totally have that party! I want to see the pictures (and come, too bad I live far away!). I so agree Michele! Get out the pretty china and use it! I confess that my pretty china spends more time collecting dust rather than being used as it should be!! Thanks so much for sharing your lovelies with us - roses are my favorite too!!! xo!! A Funny "Cuppa" For Sure!